On October 28, at ANA Crowne Plaza Okinawa Harborview in Naha, panelists discussed　possibilities of Okinawa being an international logistics base. 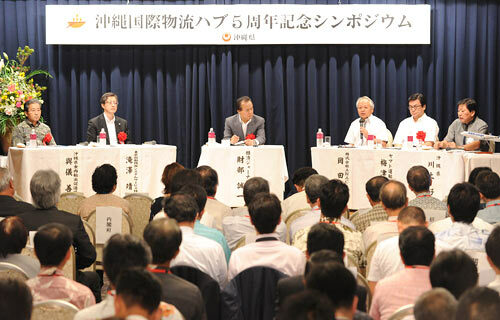 On October 28, the Okinawa Prefecture Government organized a symposium in Naha commemorating the 5th anniversary of the Okinawa International Logistics Hub. Representatives from companies in and out of Okinawa, such as ANA and Yamato Transport, were in attendance, and exchanged thoughts about the successes of the International Logistics Hub and its future potential. Head of the Global Business Development Department of Yamato Transport Katsuhiko Umetsu said, “We create additional value because producers can sell Japan’s safe and tasty food. It is a future challenge, how we can export Japan’s seasonable food abroad.” Yamato Transport is beginning its International Cool Takkyubin service, which allows next-day delivery of fresh produce to Asia. Toshiba Automated Systems Service has been supplying maintenance parts for automated banknote processing machines and other machinery to Asia since last year, using a parts center in the International Logistics Hub Industry Development Zone, Naha , as a base. Its president Yasushi Takizawa described results thus far, saying, “Initially we handled about 400 types of parts, but that has now increased sevenfold to 2800. If more new products are developed, then the number of parts handled would also increase.” He aims to expand a middleman “out-out” strategy, bringing into Okinawa parts from South Korea and China for storage before subsequently re-exporting overseas. Okinawa Vice-Governor Yoshihisa Kawakami indicated plans to expedite inspection and quarantine operations. The moderator of the panel was economics journalist Seiichi Takarabe.